For those whose PhD was funded by EPSRC (in part or whole). The salary is competitive (capped at GBP 35k p.a.) for a one-year contract. In most practical applications, turbulent boundary layers will be in the rough-wall regime. The fluid must move over the roughness, and this increased effort results in higher energy consumption in these flows. Despite decades of sustained research, we are still unable to make a priori predictions of skin-friction based on the surface topology, which is exactly what is required to design energy efficient systems. Such predictions are also necessary for improved meteorological and climate models. Existing predictive models use simple measure like the root-mean-square and skewness of the surface roughness height to predict rough-surface drag, but these methods are not applicable universally for a wide range of irregular surface patterns. Therefore, there is need to systematically identify other key parameters that are required for this prediction. In this project, we aim to explore a new systematic approach to predicting skin-friction drag from surface roughness. 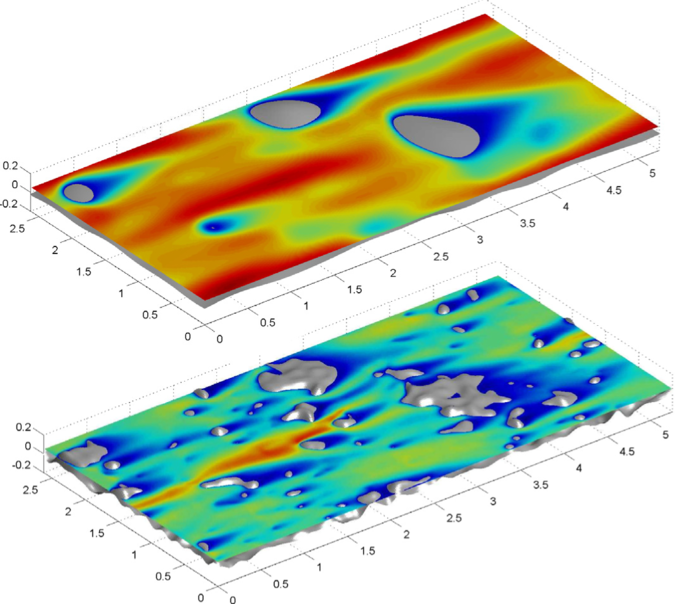 We will create a comprehensive database of flows over rough surfaces using state-of-the-art direct numerical simulations. Such a comprehensive database does not currently exist. This will allow us to use modern data-mining techniques to relate the surface properties to the overall drag. Firstly, clustering algorithms will reveal the different roughness regimes that exist. Some roughness profiles that appear different when characterised by the many possible parameters, produce similar drag. In essence, only a small region of the high-dimensional parameter space is occupied by actual rough flows. Exploiting this, the project will also explore modern nonlinear dimensionality reduction techniques to determine an optimal low-dimensional representation of the high-dimensional roughness parameter space and its mapping to drag. The code produced, specifically suited to large turbulence simulation data sets, will be made freely available to the community to apply to similar problems. This new capability will reveal the dominant roughness characteristics and their true functional relation to drag for the first time. Using simulation will allow the measurement of the flow field near the rough surface in great detail. This will allow the discovery of new relationships between surface drag, roughness characteristics and the flow field structure and the events that are responsible for momentum flux. Excellent written and oral communication skills, including the ability to publish and present scientific results, are essential. This project will develop code for GPU-accelerated simulation of the high-dimensional probability density functions found in turbulent reacting flows. In contrast to established adaptive meshing approaches that work in three dimensions, this project will involve creating new adaptive mesh procedures and codes that will be applicable to an arbitrary and time-varying number of dimensions. Applicants should have a first-class degree in a relevant discipline of engineering, physics or mathematics, experience in programming, strong interest to work on state-of-the art simulation and to apply this to real-world problems. Furthermore, skills supporting communication across discipline boundaries are desired. In chemically-reacting flows found in nature and engineering, and particularly in combustion systems, turbulent mixing leads to statistical fluctuations. Not only does turbulent flow cause the chemical composition to fluctuate in space and in time, the properties of fuel sprays or soot particles carried in the flow also exhibit fluctuations. Direct numerical simulation of a turbulent reacting flow, resolving features at scales spanning many orders of magnitude - from the nano-scale of soot particles up to the scale of practical combustion systems - is not computationally feasible, even considering the projected growth in supercomputing capacity. Therefore a statistical description based on probability density functions is needed in order to describe the distribution of the numerous different chemical, spray and particle properties that are important to the description of the processes within the flow. 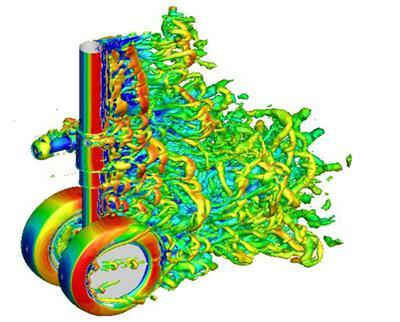 The techniques that we propose can be applied to simulation and control in a wide range of situations - from finance to space debris - but we will focus on modelling of sooting combustion because this exhibits elaborate multi-dimensional behaviour, is tractable with the proposed methods, and is one of the biggest problems currently facing automotive and aerospace engine manufacturers. To apply: via the faculty website or contact the graduate school office directly pgrsofee @ soton.ac.uk. 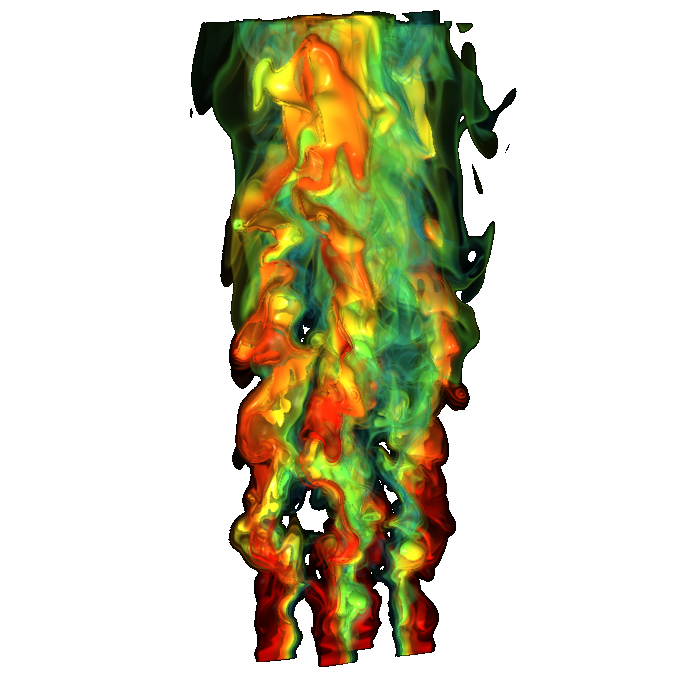 Simulated flow around a landing gear. Aircraft noise is one of the most important impacts that air traffic has on our environment. The noise at take-off and landing is largely due to the turbulent wake of the landing gear. This project involves developing new methods to predict and eliminate this noise. The work will involve extending recent developments in the low-order modelling of turbulent boundary layers to complex geometries such as landing gear. It will also involve designing and optimising noise mitigation strategies within this new framework. The end result will be a new methodology for the design and control of noise for a wide range of applications.